An Atascadero man went on a free-of-charge shopping spree at the Paso Robles WalMart, but failed to fit his overload into the getaway vehicle. Around 6 p.m. on Saturday, the suspect entered WalMart and walked directly to the electronics section. 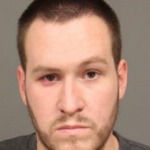 He place two flat screen televisions and one computer in a shopping cart, walked by the cash registers and out the front doors, according to Paso Robles police. On the way out, an employee questioned him if he had paid for the merchandise. Two employees then followed him out to his car, which was parked nearby. The man placed the computer in his car but could not fit the televisions in the trunk. He left the televisions behind and fled the area in his car. Officers reviewed surveillance footage and identified the man as 25-year-old Kyle James Learmonth. Atascadero police searched Learmonth’s home on Sunday, where they located the stolen computer. Police returned the computer to WalMart and arrested Learmonth for grand theft. Learmonth, who is currently on probation, was booked in San Luis Obispo County Jail. He remains in jail on $20,000 bail. Another dumb white guy from North County. hey, stop your racist comments! Remember that name….it will no doubt show up on a ballot in the future. He will go to jail for his mistake. Should have gone into politics and got elected before he started to steal! Vying for Atascadero Citizen of the Year, no doubt. LOL! Why not? Kelly Gearhart was citizen of the year, and he was the biggest thief of all!